Even when you are on the go — either traveling for work or on vacation — staying connected to the Internet is vital. 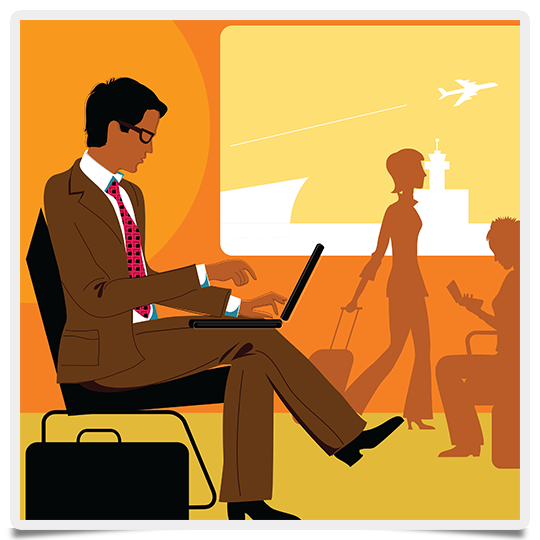 It can be hard to stay on top of your personal and professional life without good Internet access when away from home. Smartphones, tablets, and laptop computers make it easy to enjoy a digital life in a remote location, provided you can get online! With that in mind, here are a few tips for getting Internet access when traveling — either domestically or internationally. WiFi hotspots are always a good bet for Internet access while traveling. Bookstores, fast food restaurants, and coffee shops are known for providing free Internet for their customers. Return the courtesy by purchasing something from the place providing you online access. Additionally, it is never a good idea to access certain private information like your bank or credit card’s website when accessing the Internet using a WiFi hotspot in a public location. Stay smart! Prepaid Internet access cards are another good option for getting Internet access when traveling internationally. Foreigners visiting the United States also are able to leverage this option. Most major American wireless carriers offer them, including AT&T, Verizon and T-Mobile. These cards work in similar fashion as prepaid phone cards. You pay a nominal fee for a certain number of hours of Internet access. Adding additional Internet time is also an easy process. Remember that no contract is necessary when using prepaid cards. Don’t expect to stream 4K HD video to your tablet computer when accessing the Internet on the road. WiFi hotspots, hotel Internet service, and even using a prepaid card from a major wireless carrier probably won’t provide the same level of bandwidth as your home Internet service. Make sure to perform regular HTML5 bandwidth tests to verify your current Internet speed before attempting to stream any media content, especially video. Traveling doesn’t mean you have to forego Internet access. A variety of options exist to keep you connected when on the go. Just be careful when accessing any public WiFi hotspot and check out whether or not a prepaid Internet access card is your best choice depending on your ultimate destination.